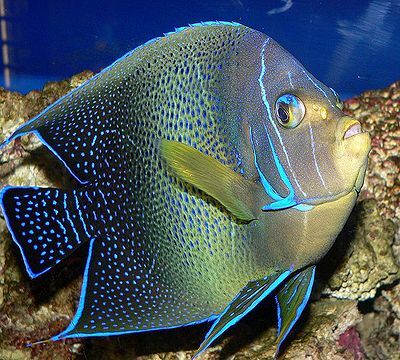 The Semicircle Angelfish is also known as the Blue Angelfish and Koran Angelfish. It is found in the Red Sea, East Africa and the tropical Indo-Pacific. Adults and juveniles have very different appearances. Angelfish in general are not very hardy, but this fish is one of the hardiest of this fish family. Males are 15.7 in., females smaller. 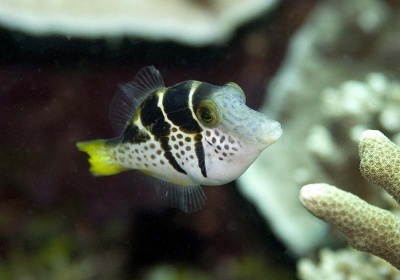 Most fish see the semicircle as cleaner fish and often ignore it. Best kept singly. Tank size is a minimum of 120 gal. This fish tends to hide in dark spots. Provide plenty of hiding spots. Feed meaty foods such as live, fresh and frozen shrimp, mysid shrimp and other crustaceans, squid and freshly opened shellfish. It also requires algae and algae-based food supplements. In a reef aquarium, it may nip at stony corals with large polyps and eat worms, zooanthids, clams and certain soft corals.